It may disappoint you to learn that finding a dedicated honeymoon bridal suite in a fine hotel is as tough as locating a wedding bandleader who'll play an extra half hour for free. Fact is, outside of traditional honeymoon destinations such as Niagara Falls and the Pocono Mountains, most top-rated resorts do not have special suites reserved expressly for honeymooners. They have studio suites and junior suites, balcony suites and villa suites, ocean-view suites and alley-view suites, smoking and non-smoking suites that accommodate all different types of guests. What Don't They Have? Honeymoon Suites! There is, of course, a sound business reason for this: Imagine if you owned a hotel (I know, you'd build a bridal suite). With a utilitarian suite decorated in a neutral style, you could rent the same quarters on different nights to a traveling salesperson, a family with a child, a grandma and grandpa in town for a Rolling Stones concert, and a pair of honeymooners. A hotel suite decorated for honeymooners tends to have a distinctive look -- yet it's rarely the stuff of Architectural Digest layouts: White or pastel-colored walls. A four-poster bed with a sturdy king-size mattress, perhaps so far off the ground a small ladder is called for. High thread-count white sheets, a duvet and a colorful bed scarf. Perhaps a canopy. A love seat. Instead of a desk, a vanity table. Thick carpeting in a cool climate, polished wood floors in a warm one. Strategically placed mirrors. Vases to hold long-stemmed red roses. And a bath big enough for two. The most romantic rooms for honeymoon couples also have a nook to cuddle up on together. And if it's under a window where you can look out and dream together, that's even better. Before you commit to any honeymoon accommodations, make sure you know what you will be getting. Don't simply trust the website: Call and ask if the rooms are up to date and also inquire as to whether any noisy construction is scheduled during your preferred dates to visit. Should a honeymoon suite contain a TV and offer wi-fi? Some properties deliberately seal couples off from the world because they a) believe that's what guests want and b) it saves the owners money. Unless you think a news blackout is the only way you will be able to focus on one another while you are away, you may be happiest avoiding such a place. As one descends the lodgings food chain, honeymoon accommodations tend to get cheesier and cheesier: Creaky white wicker furniture. Fussy bed coverings. Priscilla curtains. Fluffy rugs. Dusty lace. Walls you wouldn't want to inspect with a black light. Bathtubs shaped like anything but bathtubs. And worst of all, a bed that sags in the middle. Just because your chosen hotel doesn't have a dedicated honeymoon suite, though, don't think the staff can't make the setting ultra romantic for you. Before you check in, alert the reservations staff that you will be checking in for a honeymoon stay. With fair warning, the staff can convert that one-suite-fits-all into a custom-tailored one. 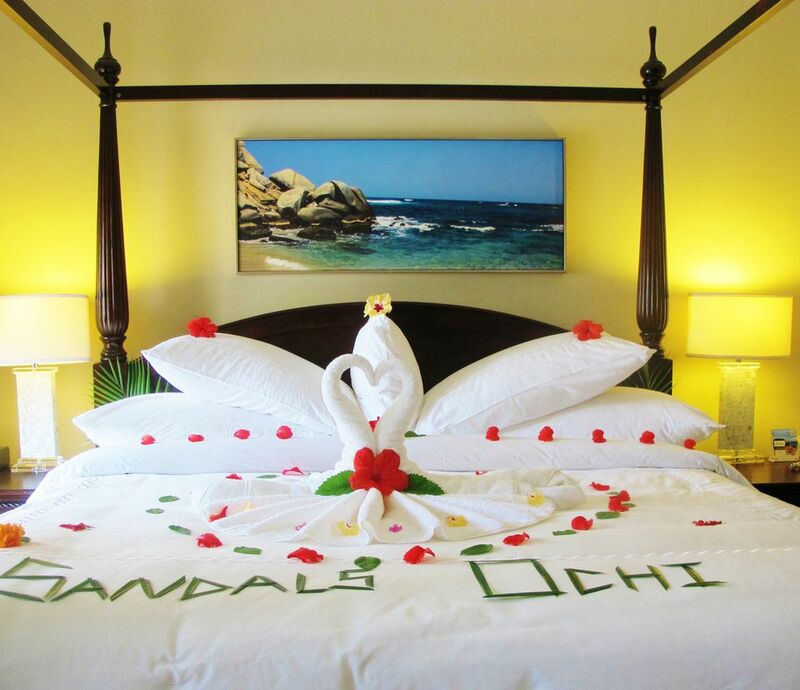 On a recent visit to Sandals Resorts, we opened the door to our unit and found a towel sculpture of a heart surrounded by fresh flower petals (see photo). Nice as these goodies are, make sure beforehand that you're not overpaying or paying for something you don't want or need. Finally, remember this when it comes to hotel rooms: In the dark, they're all alike.